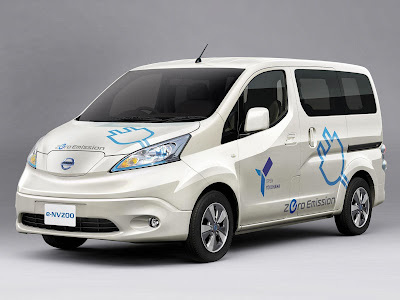 Nissan Motor plans to launch e-NV200, a 100% electric commercial vehicle, in Japan in fiscal 2014. Production will begin the same year in Barcelona, Spain. The e-NV200 model is based on the NV200 taxi vehicle, and is the second fully-electric vehicle from the manufacturer, after Nissan Leaf. The vehicle has zero CO2 emissions during operation. Its features include an advanced telematics system, and power supply in the luggage area for outdoor activities or emergency power. Its powertrain, similar to that of Leaf, enables good acceleration and quiet operation, claims the company. Nissan is in the process of creating a market for its new launch. The e-NV200's low operating cost is expected to make the vehicle attractive. The company is in talks with Yokohama, Nissan's home city, to make the e-NV200 available for public services. Nissan plans to make the latest electric vehicle part of "Yokohama Mobility Project Zero," a collaboration between the company and the city to achieve low carbon footprint. Nissan Leaf and ultra-compact electric vehicle Nissan New Mobility Concept are already included in the project. The automaker is likely to introduce e-NV200 in Barcelona as well for public transport. It is preparing to install EV charger network and parking areas to support these vehicles in the city.